The Currency Counter Cards eliminates counting errors and prolongs the life of your currency counter. The Cleaning Card removes dirt and debris from the optic lens, magnetic sensor and motorized rollers. 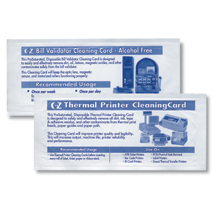 Simply insert card into bill counter to clean. Use once per week for low usage; once per day for high usage.